H2O decreasing while CO2 rises ! 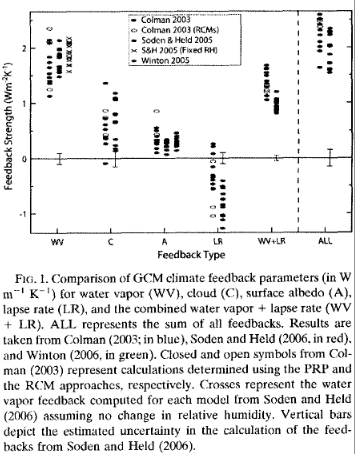 Dire predictions of global warming all rely on positive feedback from water vapor. The argument goes that as surface temperatures rise so more water will evaporate from the oceans thereby amplifying temperatures because H2O itself is a strong GHG. Climate models all assume net amplification factors of between 1.5 and 6. But in the real world has the water content of the atmosphere actually been increasing as predicted? NASA have just released their latest NVAP-M survey of global water content derived from satellite data and radio-sondes over the period from 1988 to 2009. This new data is explicitly intended for climate studies . So lets take a look at the comparison between actual NVAP-M atmospheric H2O levels and those of CO2 as measured at Mauna Loa. I have extracted all the daily measurement NVAP-M data and then calculated the global average. Figure 1 shows the running 30 day average of all the daily data recorde between 1988 and 2009 inclusive. The 365 day (yearly) running average is also shown. Plotted on the right hand scale are the Mauna Loa CO2 concentration data in red over the same period. Fig1: Total precipitative H2O (running 30 day average) compared to Mauna Loa CO2 data in red. The central black curve is a running 365 day average. There is indeed some correlation in the data from 1988 until 1998, but thereafter the two trends diverge dramatically. Total atmospheric water content actually falls despite a relentless slow rise in CO2. This fall in atmospheric H2O also coincides with the observed and now widely accepted stalling of global temperatures over the last 16 years. All climate models (that I am aware of) predict exactly the opposite, so something is clearly amiss with theory. Is it not now time for “consensus” climate scientists perhaps to have a rethink ? My thanks to Ken Gregory for help with the data. The conversion from NetCDF was a bit of a nightmare ! NASA NVAP-M data is available here. Thanks to NASA Water Vapor Project-Measures (NVAP-M) team. update 22/4: There is no inherent reason why atmospheric water content should be correlated with CO2 content. 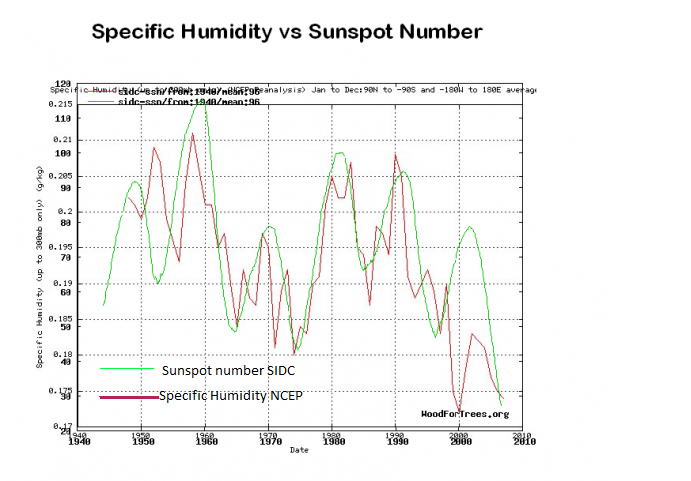 However, models typically assume a constant relative humidity so that if surface temperatures rise (AGW) then so does the total H2O content in the atmosphere. This post highlights the lack of correlation between the measured CO2 levels and the measured H2O levels in the atmosphere. The instrument accuracy of the NVAP-M data has been questioned in the comments. If it can really be shown that systematic errors still dominate the data, then no firm conclusions can be drawn as yet. This entry was posted in AGW, Climate Change, climate science, Science and tagged Climate Sensitivity, CO2, Feedbacks, H2O. Bookmark the permalink. 35 Responses to H2O decreasing while CO2 rises ! You need to rule this possibility out in the NVAP-M data. Also, in 1997 there is a step change in the NVAP-M data, with no corresponding change in the CO2. If there was a coupled feedback, I’d expect to see something. Thanks for the tip! If there is indeed instrument failure remaining in the data then we can’t draw any strong conclusions. I had thought that NVAP-M was the re-analysis that was now suitable for climate studies. I looked through the NVAP-M website, and no mention of this sesnor failure. They may not be aware, or maybe not relevant to their data, but that sharp dropoff in 2009 looks more like sensor failure than physical process, especially since there was an SSMI failure that year. You might inquire with them. I wonder where the water went! The fact is that we can’t account for the lack of water in the atmosphere and it is a travesty that we can’t. It’s hiding in the deep ocean. Roger Pielke Sr. had a number of posts over the years on humidity. You might find it interesting to do a search of his now-closed site. The coupled feedback is actually between the Sun and water vapour, not co2 and water vapour. From that it looks to me like the big dive in water vapour is after the big ’98 el nino and would be due to the prevailing la nina conditions 1999-2002. After a recovery, the effect of the quiescent Sun kicks in after 2004. Earlier analysis by Josh Willis of Argo data showed a cooling of SST from 2003. This has been turned into a warming by ‘adjustments’. Similarly, the Envisat data showed a fall in sea level from 2007, contradicting the Colorado sea level data. Envisat has been terminated. I see no sun to CO2 connection here. There is no corresponding step change in solar data in 1998. I’d look for changes in sensors/platforms that is introducing different data, some conversion from NetCDF error, or some other technical explanation first. Once those are ruled out what you have left is then something you can analyze. If you don’t, you aren’t being skeptical. Look at the data variance, Prior to 98 there was a different pattern to annual variation, somewhat more random, different peaks and troughs, post 98 it looks less varied and more uniform. Several changes in the NOAA Tiros Operational Vertical Sounder (TOVS) retrievals during the 1990’s. And lack of any instrument-to-instrument calibration when the dataset was produced. TOVS data provides much of the information over land. Changes in the microwave ocean algorithm and supporting data (sea ice, sea surface temperature), and lack of any intercalibration of the Special Sensor Microwave / Imager (SSM/I) instruments onboard six different satellites. Radiance intercalibration of this important dataset is just beginning to appear in 2010. Production of NVAP in four steps during the 1990’s, with new instruments as they became available. Large natural geophysical events occurring during the time period (1987 ENSO and transition to 1988 La Nina at the beginning of the record; Pinatubo eruption in 1991, large 1997-1998 El Nino. Whether or not one uses these events in a trend study can impact the slope of the trend line. Pretty much tells you all you need to know. OT, but an interesting feature on the NVAP plot is that the upturn at the start of nearly every year continues to midsummer. But in 1991 the upturn is rapidly followed by a strong downturn – six months before Pinatubo erupted. Odd. The “NVAP trend statement” linked in Anthony’s post was specifically for the NVAP Heritage data. The NVAP-M data, which is the subject of Clive’s post, was adjusted and corrected for the “time-dependent biases”. Thanks Ken for that update. What would explain the sharp dropoff in 2009 then? We don’t know what caused the sharp dropoff in 2009. Clive’s plot is from the 8036 files of daily total precipitable water (TPW) gridded data recently released. 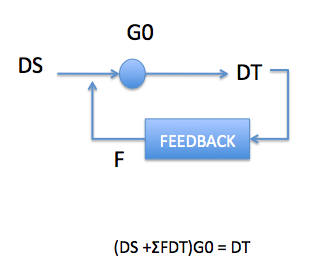 Here is my graph of the TPW overlayed on the graph from the Vonder Harr (2012) paper. Clive averaged all the daily data for each month in each one-degree grid cell to get the monthly average for each grid cell, then calculates the global average for each month. This gives a close match to the figure in Vonder Harr (2012). Calculating a global average for each day, then averaging the days in each month gives significantly different results. The match isn’t perfect. I don’t know whether the data was slightly changed since the paper was published, or our averaging method is slightly different. As shown in the article “NASA satellite data shows a decline in water vapor” we show that a water vapor change in the upper atmosphere has a much greater effect on outgoing longwave radiation than changes near the surface. A change at 300 – 200 mbar has 81 times greater effect than a change at surface to 850 mbar, so I want to see what NASA did with the layered data. I wanted to publish the trends of the NVAP Heritage layered data BEFORE they adjusted, corrected, manipulated it, so it can be compared to the adjusted NVAP-M layered data. We still have some processing issues with the NVAP-M layered data, but is appears that the decline of the 500 – 300 mbar layer from 1995 to 2001 has been turned into an increase. The 300 to 100 mbar data appears to have a very large discontinuous increase from December 2008 to January 2008, especially in the southern hemisphere. Don’t know for sure if that is a problem with the NVAP data or our processing. I’ll have several questions for the NVAP people after we confirm that our processing is correct. Indeed Fig 1 looks like the H2O was adjusted up to 1999 at which point the adjustments could no longer be sustained, so then the dramatic breakaway from 2000+ — Bayesian data anlaysis a la climateers. This is reminiscent of what I consider to be the #1 error underlying today’s climate science — using the wrong model of equilibrium stability. A quick story as illustration: I did some air pilot training long ago, and the first times I hung on tight to the steering wheel to keep the plane flying level. Finally the teacher said “You look like you’re holding onto the tiger’s tail” and I agreed I was. So he said just let the wheel go which took me a bit of processing but eventually I did let it go and the plane just flew itself! So this reinforced a distinction between two kinds of equilibria: (1) STABLE equilibrium, such as the equilibrium of a marble at the bottom of a bowl, which when perturbed just goes back to the bottom, and (2) UNSTABLE equilibrium, such as the equilibrium of a marble at the top point of an upturned bowl, which when perturbed leaves that point never to return. My pilot time showed me once again that physical law features STABLE equilibria in all its manifestations, else the universe / Earth would have gone to hell in a handbasket long ago. My own break with “climate science” came when I realized that the whole climate scare depended on the underlying notion of unstable equilibria, the runaway greenhouse effect notably. Anyone who understands physical law knows that this just isn’t possible, and that the Earth has come 4.6 billion years to the current benign environment because there were (and are) no unstable breakpoints. Thus when the measurements show that increasing CO2 causes H2O to decrease, then one must say OF COURSE this happens, it must happen, because physical law mandates stable equilibria. We’re talking a priori science here, or 4.6 billion years of a posteriori, which is the same thing as far as we are concerned. So this is where I think the #1 error of climate science is — “the Team” think that our environmental equilibria are unstable, that we are holding onto the tail of the tiger, and if we move away from balance we are heading for a screaming death — the Arctic death spiral — the runaway greenhouse effect — you name it. THIS IS COUNTER TO PHYSICAL LAW. Thanks for all the comments! I am travelling at the moment without any connectivity. I will be able to respond properly on Monday evening. “The collapse happened during the deep solar minimum of 2008-2009—a fact which comes as little surprise to researchers. The thermosphere always cools and contracts when solar activity is low. In this case, however, the magnitude of the collapse was two to three times greater than low solar activity could explain. What is going on is the entry into a solar grand minimum. Hence the ‘regime change’ in terrestrial magnetic records noted by Anthony over the last several years – and constantly poo-poohed by L. Svalgaard. How do these measurements from NASA show increasing CO2 causes H2O to decrease? There is no inherent reason why atmospheric water content should be correlated with CO2 content. However the implicit assumption in most climate models is that of a positive feedback from H2O to an initial CO2 radiative forcing. Models typically assume a constant relative humidity so if temperatures rise then so does the total H2O content in the atmosphere. In this post I was highlighting the lack of correlation between the measured CO2 levels and the measured H2O levels in the atmosphere. Clearly if it can be shown that there are still large systematic errors in the new NVAP-M results then no firm conclusions can be drawn yet. I disagree. Both are linked to ocean temperature but don’t be mislead by the ocean surface temperature as the whole thing, there are some very long time constants. How do they treat air columns that contain clouds as well as water vapor? The scientifically honest thing to do would be to also plot the trend given by Clausius-Clapeyron with the measured temperature (which IS what climate science expects to happen and is the ‘source’ of the expected water vapor feedbacks) – how much would that expected to be – 0.01mm / decade or 0.1mm / decade? Also the actual water vapor that matters most is the one at slightly higher altitudes – how much would THAT expected trend be – 0.001mm / decade or 0.01mm / decade? I agree with you. Once we have sorted out problems with the layered data, then we can study how the higher altitude water vapor varies with temperature. GCMs use a mean feedback from H20 of ~2Watts/m2/K, so this should be visible in the NVAP-M data assuming temperatures have risen ~0.4K since 1988.See below. You are still trying to change the subject – your main plot was about the amount of water in the troposphere, on which you could calculate a very rough approximation of the expected trend over each decade given that we have data showing the trends of the whole tropospheric temperatures (which are hoiwever much closer to 0.1 degress / decade – http://www.woodfortrees.org/plot/rss/from:1992/plot/rss/from:1992/trend). The amount of forcing that you quote above is in no way equivalent to that (and in general are much more accurate when speaking about equilibrium, from which we are very far away) – instead we are here speaking about something very simple = how much more water vapor was expected to be found (based on very basic physics like Clausius-Clapeyron) vs. how much it was experimentally measured. This also is a decent point why the feedbacks are never to be considered as acting instantaneous – the rate of warming generates delays which sometimes are quite long.
. Which of the data sets you used? Or if you used both how did you combined them?
. Which method did youuse to take the irregularity of the grid into account? Did you projected the grid? Using which projection? If instead you worked with geodetical coordinates did you applied some kind of cell area estimate? All of this would become clear if you publish you source code. The data used in the re-analysed NVAP-M released on 1/04/13. see : https://eosweb.larc.nasa.gov/project/nvap/nvap-m_table . The data consists of daily netCDF files. Each file contains 1-degree lat,lon grids of TPW values in mm of preciptitative water. I extracted all the data and then for each grid peformed a global average to give just one daily value of TPW. The graph shows the 30 day running average of TPW over the whole period from 1988 – 2009 included. The code for the global avergae is based on the same code used for CRUTEM4. I can make the code available later for the data extraction from the netCDF files, but first you need to install netCDF interface software first (C or Fortran) – which is not easy. This is the code snippet for the global averaging. Hi Clive, thanks for posting the code. You are taking the Earth as a sphere, and cell areas are just a very rough estimate. This may explain the descrepancy between your results and the paper you mention. But now I’m convinced the general trend you identified is indeed valid. The first derivative of 48-month moving averages of temperature and atmospheric H20 should be very similar and unrelaed to atmospheric CO2. I encourage you to dig depper into this and submit the results to a peer reviewed publication. 1. It is good that NASA have published the full data stack that will allow folks like yourself to examine spatial, vertical and temporal variations in H2O. But have NASA published any reductions of the data themselves? 2. I find it curious that the peaks are centred on the N hemisphere summer since most of the ocean is in the S hemisphere. Any ideas why that should be? 3. The change in gradient in 1999 is consistent with the 1998 el nino / shift in the PDO and the general H2O trend seems to match global average temperature in a general way – increasing to 1998 then sideways. 4. The scale of variation is rather large – peaks of 30 and a trough of 20 in 2009 – doesn’t seem plausible, especially since this has not yet shown up in the surface temperature record. I guess Anthony makes a good point about instrument integrity. 5. Any way to convert mm precipitable water to ppm water vapour? 6. Are you familiar with this work? If you have not seen it, it is well worth a look. 1. NASA have actually published a reduction – Vonder Harr (2012) . See also comment of Ken Gregory above. 2. There are far larger seasonal swings in the Southern Hemisphere. The SH TPW is actually greater in S winter (N summer). I will show to SH/NH comparison in a week or so. 4. There are also larger seasonal variations in CO2 than there are multi-annual changes. 5. I don’t think it is possible to define a sinple ppm for water valor. The variation with altitude is too large. 6. Thanks for the pointer. I will take a look at the paper. NZ Willy—Re “Stable/Unstable equilibria”: This makes sense to me. The molecular weight of CO2 is almost 2 ½ times greater than H2O vapor. Water changes state. Gravity is constant. It “seems” to me that as atmospheric CO2 increased, the column pressure would increase ever so slightly and a concomitant amount of H2O would precipitate back to the liquid state. This would put the combined greenhouse gases back into a stable ratio. Pingback: 22 Very Inconvenient Climate Truths | Watts Up With That?